January tends to be a time of research and development for me. I’ve finished all of the custom orders that come around the holiday season, and I can spend some time thinking about what new art dolls I want to bring to life. I put a lot of time and effort into the design of each of my creatures, because it’s important that they be fun and cuddly while also being able to stand up and have a good amount of durability. I sculpt each part by hand, and then make molds of them using silicone rubber. Once that’s all finished I can make resin casts of the parts. A lot of artists prefer to sculpt each art doll individually, and I think that’s great. My personal preference is for resin casts, because they are much more durable than something like Sculpey or even Apoxie Sculpt. I want my creatures to be your trusty companions on any adventure, which means they have to be pretty tough. 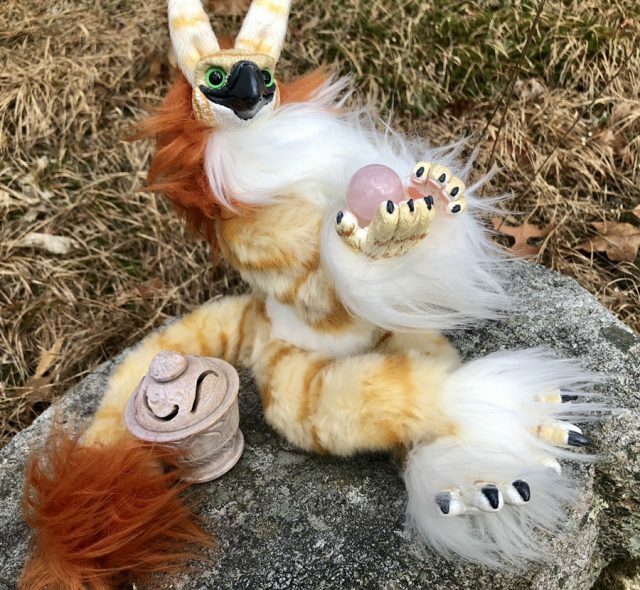 Once the hard parts are done, I have to set to work designing and testing the pattern for the body, which is how we arrived at this fabulous beasty! I’ve had several people ask me for a bipedal/anthropomorphic type of creature for a while, so I’m finally giving it a test run. I also have been wanting to test the parts I’ve made for an eventual gryphon creature. So this guy is a kind of mix and match of tests all jumbled into one stripy ball. I had a lot of fun testing out his ears, and I think they’ll work quite well on a gryphon creature. And the body will be perfect for anthro cats and canines! 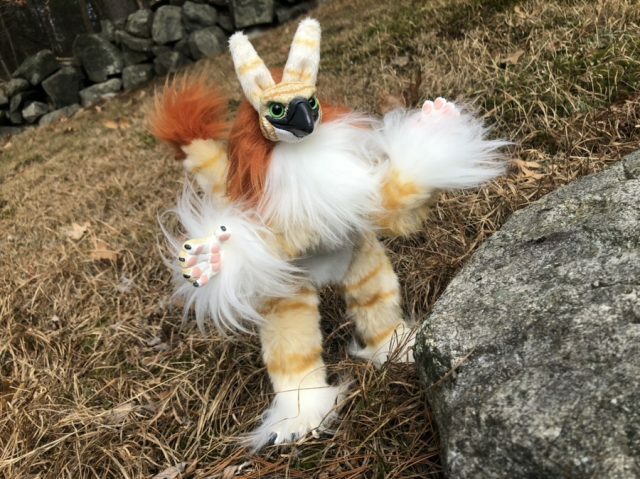 I may even make a few more of this strange gryphon beast–Griffs?–because folks on Instagram really loved him as he was. He can sit in a number of poses, but he can also stand up to menace anyone who dares come near your desk! I had a lot of fun playing with the long fluff on his hands and feet, too. A very successful test, and a great start to the new year! I hope everyone has a happy and safe 2019!